Originally published in 1931 as Kansas Geological Survey Bulletin 18. This is, in general, the original text as published. The information has not been updated. An Acrobat PDF version (51 MB) is also available. 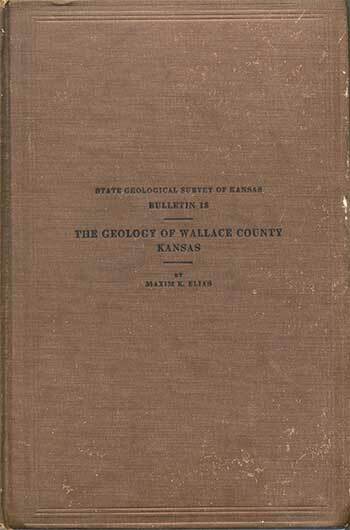 The following report on the geology of Wallace County is more than a county report. That is to say, it is not merely a description of features that pertain to Wallace County alone--its topography, rock formations, geologic structure and mineral resources--but it gives information that bears on the geology of a large part of the contiguous plains territory in western Kansas and eastern Colorado. Wallace County is peculiarly situated as regards the effective attack on several problems in the geology of the plains country. It offers some of the best exposures in Kansas of the Upper Cretaceous Pierre shale and shows many very interesting features of the overlying Tertiary deposits. The painstaking field investigations of Mr. Elias and his thorough studies in the preparation of his report have resulted in an important contribution to the knowledge of western Kansas geology. The stratigraphic subdivision of the Pierre shale which he has worked out is useful both from the standpoint of development of mineral resources, in making possible the more accurate delineation of geologic structure of the Pierre shale areas, and in providing the basis for detailed comparison with the younger Upper Cretaceous rocks of other areas. Also, in his studies of the Tertiary deposits, important new facts have been learned concerning the origin and stratigraphic sequence of various beds. In the case of certain fresh-water limestone some very interesting problems are presented which bear on the geologic history of the entire Great Plains country. One result of the work by Mr. Elias in Wallace County and adjacent districts which is not contained in the present bulletin is the description of many of the interesting fossils that are contained in the Cretaceous and Tertiary formations of this region. A considerable number of these are new to science. Paleontologic papers on cephalopods of the Pierre shale and on a variety of fossil seeds from the Tertiary Ogallala beds have been completed and will be published in a separate bulletin. Western Kansas contains a truly remarkable record of the extinct life of parts of the geologic past. It is an interesting part of the geologist's work to make known the plant and animal organisms of the remote past in the history of Kansas. Residents of Wallace County and visitors to this part of the state will find material in this report which should arouse their interest and appreciation, and there is also here offered for the first time detailed information concerning geologic features that are basic to the economic development of the region. Raymond C. Moore, State Geologist. Placed on web Nov. 17, 2014; originally published April 1, 1931.